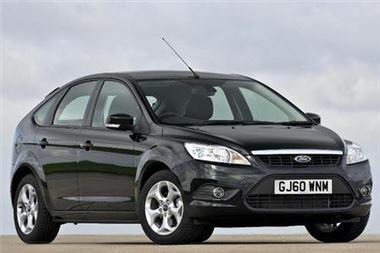 4 October, 2010 – Ford is offering an end of line 'Sport' special edition, priced £700 over the Zetec, but with £1,500 of extra equipmewnt and bound to be heavily discounted. The added style and technology features combine to create a striking, great-to-drive all rounder. The attractive Focus Sport offers comfort and convenience with standard equipment including: satellite navigation with European mapping, Bluetooth and USB connectivity, voice control, parking distance sensors, 16-in ST-style alloy wheels, auto headlamps, rain-sensing wipers and self-dimming rear-view mirror. The Focus Sport is available in the five-door bodystyle with a choice of the two most popular engines: the 1.6-litre 100PS petrol manual and the 1.6-litre 109PS TDCi manual. The Titanium seat fabric "New York Ebony" can be found inside whilst outside there is a choice of six body colours including Vision Blue. David Calder, product manager, Ford of Britain, said: "We wanted to create a stylish and practical package which represented outstanding value for money, and the Focus Sport delivers that. This is a vehicle that should appeal to our retail and fleet customers alike, and will continue to be offered alongside all-new Focus through 2011." On-the-road prices are £16,545 for the 1.6-litre petrol and £17,845 for the 1.6-litre TDCi. Expect to be able to chip quite a lot off. The car will remain on sale alongside the new 2011 Focus through 2011 until stocks are exhausted.